Have you ever dreamed about designing the perfect master bedroom? Creating a space where you can rest after a long day's work is an important feature to your home. Sadly, very few of us remodel our bedrooms into the personal enclaves we desire. There are a number of reasons why you would want to remodel your master bedroom. You may simply want a change, or you may require additional space. Many homeowners remodel to accommodate physical limitations. Whatever the reason, this guide will explore how to design the perfect master bedroom that will not only fit your needs, but also be a room you look forward to retiring in at the end of a busy day. Will You Do the Work Yourself or Hire a Professional? What Furniture Do You Need? As one of the most intensely used rooms in our homes, bedrooms are popular candidates for remodeling. While it's easy to recoup a good portion of the remodeling costs when you sell your home, bedroom renovations can be quite expansive in terms of price and requirements. The average homeowner will spend in the neighborhood of $8,000 remodeling their master bedroom, but that number can vary greatly depending on the extensiveness of the project. Setting a reasonable budget is a critical part of a successful remodel. Be sure to build into your budget money to deal with the unexpected, but stay discplined and don't allow yourself to vary too far from your original plan. Added expenses can accumulate quickly and it's easy to suddenly find yourself spending far more than you would have dreamed! Like with any other renovation, the cost of remodeling your master bedroom boils down to the complexity and scope of the work, the features you want to include, the kind of finishes and materials you desire, and the amount of labor required. It's important to take a step back and determine which improvements are meaningful and which ones you can do without. Keep in mind, that the most meaningful improvements are often those that are driving you towards a remodel in the first place. After you've decided on the improvements that you want included, you'll be able to determine the overall cost and then set your budget accordingly. Be sure to add some extra funds to cover the unexpected, as even the best laid plans have a few surprises. If you are a do-it-yourself kind of person, you may enjoy taking on a master bedroom remodel project. Many people choose to do the majority of the work themselves and then hire a contractor to work on specific tasks, such as the plumbing and electrical. Others prefer to hire the entire job to a contractor. In most cases your decision will be largely determined by the scope of the work necessary and your comfort and skill level. One of the benefits of hiring a contractor, is after you present the project, he should be able to give you an accurate bid and inform you of any challenges he may face. Once presented with the bid, and assuming it's within your budget, you'll be able to, for the most part, sit back and watch him work! When you hire a contractor, they'll be responsible for managing all aspects of the project and keeping things moving. This means you’ll pay the general contractor an agreed amount and they'll use that payment to cover the materials, cost of labor and any other necessities. Are you a member of the Home Builders Association? Will you document any changes in writing? Will you acquire the building permits needed? Can you provide start and finish dates? Do you require an advance (usually 10 to 20%) prior to beginning? One of the best things about remodeling your bedroom is choosing features that make the room more livable. Luckily, there are limitless design elements for creating your private oasis provided you have the creative vision and budget. Large Master Bathroom - No matter how many bathrooms you have in your home, nothing beats having a grand bathroom with lavishing and convenient features, such as, built-in vanities, dual sinks, and color schemes that blend with your master bedroom design. Walk-in Closets - Storage space is always at a premium and if you have the space and budget to add a large, well-designed closet with all the organizational perks, you'll have an opportunity to enjoy convenience and luxury at its best. ADA Compliant - Remodeling your master bedroom to meet the Americans with Disabilities Act (ADA) compliance standards can be a smart move. It'll likely add value to your home when it's time to place it on the market without a lot of added expense. Outdoor Entrance - A separate entrance that opens onto a deck or patio can add a "rich feel" to your master bedroom. Whether you have a deck or patio or are considering adding one, the added expense is rewarded by the convenience of having the outdoors so easily assessable. Adding a sliding glass door or French door to your master bedroom not only lets in loads of natural light, it also provides easy access to your patio in case you need a place to relax. Ultimately, the goal of remodeling a master bedroom is to create a multi-functional space where everything you need is available in one place. The tricky part is having enough space to incorporate all the amenities you desire. Once you've made up your mind to remodel your bedroom, it's time to start researching. The more time you spend up front in the planning phase, the easier the project will be and the fewer surprises you'll run into along the way. Begin by exploring the types of materials and accessories needed. Focus on the pro's and con's, as well as the cost. This should be a fun and enjoyable part of the project because you can imagine and let your dreams run wild. Not all of your ideas will be realistic, but this is the time to visualize and brain storm. Magazines, design galleries, and home-building reality television programs can all spark great ideas. Then you can begin pricing and estimating costs to build a realistic budget. By the time you're ready to move to step 2 you should have a realistic plan and budget in hand for your master bedroom remodel. To bring your bedroom design to life, you need layered lighting, which is a fancy way of saying multiple light sources. By utilizing a number of different light sources, less shadows and glare will be present. Layered lighting will also add depth and dimension to the room and give it a warm, well-lit balanced look and feel. As the name suggests, task lighting is the type of light that helps you do your tasks seamlessly by providing a smaller beam of light in a concentrated area. Making task lighting ideal for reading, dressing, or grooming. Floor and table lamps are good examples of task lighting because they provide additional light to a specific area. Sconces are also an excellent choice, as they are mounted on a wall, add a stylish look yet still fulfill their lighting task. The role of ambient lighting is simple; provide overall illumination to the room. In most cases this is done with overhead recessed lighting or with a fixture. A wall mounted sconce can also fill this role. If you're planning on installing new ambient lighting with your master bedroom remodel, we highly recommend purchasing fixtures that have dimming capability. By simply adjusting a wall mounted switch, you'll be able to adjust the brightness in your bedroom based on the mood you're creating or the time of day. If you install several switches, you'll have even more options. Accent lighting adds a dramatic focal point and directs the eye to a specific area in the room. If you have an architectural feature you'd like to draw attention to, or a painting, bookcase or some other item or area in the room, accent lighting is the best way to draw visual interest. Track lighting or backlighting are good examples of accent lighting, if you have photos or paintings you may even want to use a picture light. Before running out and buying all the lights you think will look fantastic in your new bedroom, ask your self a few questions first. Your ultimate goal is to find a lighting solution that best meets your lifestyle. Do you and your spouse go to bed at the same time? Do you read before falling asleep? Do you or your spouse typically fall asleep before the other? At this point you're probably looking thru catalogs, watching remodeling programs and seeing lot's of great ideas. But before you break out the credit card, you need to evaluate the style of décor that’s in your master bedroom. What looks fantastic in one environment may not work in another. Is your bedroom style eclectic, contemporary or traditional? There's no rules that you can't mix and match, but it should make sense for the room. In most situations, your ultimate lighting goal is to have a well-lit room that offers soft environment. The easiest way to achieve this is to layer the lighting, which simply means mixing it so that it comes from a variety of sources. If you have a seating area in your master bedroom, perhaps a floor lamp will add a stylish touch. Task lighting such as table top lamps or wall sconces allow for evening reading, and recessed overhead lights strategically placed should add enough illumination to give the room an overall brightness. The key point here is to determine where you need light and then layer it in to add variety. Layers can be turned off or dimmed, but the more layers available, the less the room will rely on any single layer. Are there electrical outlets available where you plan on having lamps? Will you need a floor electrical outlet for a seating area? Do you want dimmer switches for your recessed lighting? How many dimmer switches? Multiple dimmer switches offer plenty of options to set the mood in the room. Take the time to walk thru every aspect of your lighting plan. It's a lot easier to make changes to your remodeling plans before you start than after you finish. Having a few extra, unneeded electrical outlets is always better than not having enough! Begin lighting your bed first and then move outward to the rest of the room. In most cases, the bed is the centerpiece of your bedroom since it's the largest piece of furniture. By adding accent lighting to the pillows, you can bring attention to your beautiful bedding or a stunning headboard. If you're lucky enough to have a patio door or several windows in your master bed room, ventilation will most likely not be a concern. But in many situations this isn't an option, and let's face it, bedrooms can get stuffy. There are a few things you can do to help improve the ventilation in your bedroom. If you have the ability, you may want to consider adding a window or two to your remodel. Adding a ceiling fan can help move the stagnant air, and air purifying plants will not only help with the stuffiness, but also add a touch of class. Most homeowners assume that when they complete a major remodel their furnace will be able to service the changes. In many cases it's not an issue, but if you are renovating an older home, adding a new addition, or your furnace is already taxed, this may be a real problem. Imagine your disappointment when your master bedroom is finished and looking exactly how you planned, but you're constantly cold because of inadequate heating. Depending upon the extent of your remodel, you may need to adjust or add heat registers, or even install baseboard heating. As important as the flooring and lighting is, it's the walls that pulls the room together. The possibilities are endless when it comes to your choices. If you decide to paint your walls, you can use the same color throughout, or you can select an accent wall to "pop" the overall look. You can use wallpaper, wood panelling or linen finishes to be as bold or as subtle as you choose. The trim can stand out or blend into your wall covering. The choices you select with your walls can make your room look larger and appear more open. Or you can also add a warm and welcoming feel, or perhaps you want the room to provide a bold and powerful atmosphere. You can literally create whatever "feel" you desire. We recommend thumbing thru some design magazines for some thought starters. Once you're done with the renovations and remodeling, it's the little details that you incorporate afterward that determines the success of your overall project. You want your new space to offer plenty of comfort, add loads of light with the perfect fixtures, and be a place you look forward to spending time. From the door to the window, you want everything to work together cohesively regardless of where you physically are within the room. You've done the hard work, now it's time to add the finishing touches to pull it all together. Bed - Your bed is one of the most valuable items in your bedroom and from a visual perspective, it's usually the centerpiece. It can offer you a comfortable place to relax during the day, and a spot to recharge at night. Finding the perfect bed frame may take some time, but it's time well spent as this piece of furniture will play a critical role in your new master bedroom. 1. How old is your mattress? The lifespan of a mattress is 8-10 years, however Oklahoma State University conducted a study that found that most people slept better and had less back pain when they purchased new bedding after 5 years. 2. Mattress sags in the middle. The mattress is breaking down and it's not providing proper support. 3. Mattress has a ridge in the middle. The mattress support has broken down. 4. You feel as though you're going to roll off or to the center of the mattress. Your mattress is no longer providing any support. 5. There's lumps in the mattress. The padding and foam layers have shifted within the mattress an it's no longer able to provide the support and pressure relief desired. 6. Your arms and/or legs tingle in the morning. Your mattress is not providing the pressure relief needed. 7. Morning back pain that does not last all day. It's time for a new mattress! Yours isn't providing the support you need. 8. Never enough room in your bed. It's probably time to purchase a larger bed. Frequently pets or children join us in bed and there just isn't enough room. 9. You frequently wake up when your partner moves. Consider purchasing a new mattress that minimizes movement. Nightstand - The nightstand can be more than just a holding table for a lamp and alarm clock. Nightstands, or also known as bedside tables, come in all shapes and sizes, from small chests to simple tables. They can match your bedroom furniture or look fashionably "out of place" to provide a modern chic look and feel. Do you want to be able to store items in your nightstand? Do you want a nightstand on each side of the bed? or only one? How large of a nightstand do you want? The nightstand should roughly be the same height as your mattress. The depth of the nightstand shouldn't be deeper than 24 inches. Vanity - A vanity is simply an elegant dressing table that consists of a large mirror, table, and seating area. It comes with drawers and shelves which you can be used to store a makeup kit, beauty supplies, perfumes, and jewelry. Not every bedroom has the space for a vanity, and some that do have space choose to omit it altogether. But when added to your master bedroom, a vanity can add a touch of style that compliments and enriches an already stylish design. The bed may be your centerpiece, but the vanity can take it to a whole new level. Whether you choose a vanity that matches your bed or a vintage design, you'll enjoy the extra storage space it provides, as well as the richness it brings to your newly remodeled master bedroom. Closet - Closets have come a long way over the years. From opening a door and reaching in to select your days wardroom, to today's master closets that can be the size of a small room! Many homeowners decide to add a walk-in master bedroom closet when they do a remodel, and if you have the budget and space, these large rooms often become the favorite spot in the house! In truth, this is a topic that deserves far more time than what the scope of this article can provide. But regardless of whether you have a walk-in closet or a reach-in closet you'll want to take some time and plan the layout to meet your needs. There are plenty of closet companies who can help give your suggestions and do the job from start to finish. There's seldom only one option when it comes to laying out your bedroom furniture. Since your bed is the largest piece of furniture it's typically best to position it first and then build outward. Leave 36 inches of space between any doors and your bed and a minimum of 24 inches on each side of the bed before a wall. The extra space will give you room to easily move around. A best practice is to position the bed on the wall opposite the main entrance. In most cases, the bed will be centered on the wall. But you may want to do something different, and there are no absolutes. If you have a view from your bedroom, you should definitely take advantage of the sights by placing the bed so that you can see the ocean, mountains, trees or whatever. Imagine being able to enjoy the view when you first open your eyes in the morning. If your bedroom is tight, you can get a little extra space by removing the foot board from the bed. This will also help visually by making it seem not quite as large. Adding a mirror will give your bedroom the feel of openness and make it seem larger. Need more storage? Adding shelves and large bedside tables with drawers can help maximize your storage space without using additional floor space. Divide large bedrooms into separate spaces. Separating sleeping and sitting areas can give the room a rich, stylish feel . . . much like a 5 star hotel! If possible, have at least one chair in your bedroom. You'll be amazed at how often you it. A minimum of 36 inches should be left in front of dressers, closets and other items to allow for easy access to drawers and doors. If your bedroom has cold surface floors, such as hardwood or ceramic tile, consider placing an area rug. A rug adds warmth to the room, minimizes noise and adds character. Pillows - Since your bed is the focus point of the room, it makes sense that it should look the part. Pillows are for more than sleeping and decorative pillows can really dress your bedroom into a classy space. Whether you're looking for lot's of pillows on your bed or just a few, there's a number of different arrangements you can select to give your bed the finishing touch it needs. But decorative pillows are just for show and getting a good nights sleep is what's really important. Selecting the right sleeping pillow will help you catch your zzz's and wake up well rested. Consumer Reports recommends to determine your dominate sleep position and then find a pillow that matches how you sleep. There are 4 types of sleepers: Side sleeper, back sleeper, stomach sleeper and combination sleepers, and each type has specific pillow characteristics that works best. Bedding - Soft-to-the-skin sheets and warm cozy blankets and comforters can play a big role in a quality night's sleep. When selecting a comforter, look for one that's not only attractive but also provides a level of warmth for sleeping. Whether your tastes lead you to muted tones for a serene bedroom, or graphic prints for a bolder look, think of your bed as a blank canvas that will set the tone of the room. 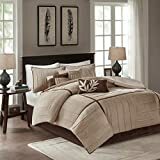 Beige brown color decorative 7 pieces comforter. Created with stripe pintuck pattern. Made from microsuede and polyester suede.The soft and luxurious beige micro-suede comforter makes the perfect backdrop to the chocolate and brown accents, making it the perfect fit for any soothing decor scheme. Contemporary design, machine wash.
What type of darkness do your need to get your best sleep? Do you enjoy the moon shining in your window thru light weight curtains? Do you need total darkness? If total darkness is the key to waking up rested and ready to go, you may want to install black out shades that can be pulled down at night, and then use other, more decorative curtains to enhance the room's beauty during the day. 100% BLACKOUT FABRIC: The delicately woven material reflects the light and blocks out the heat, allowing you to create a pleasant natural light and climate indoors. 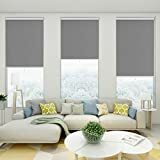 Child Safe Cordless Operation: The blackout roller shade is completely cordless and therefore making this an ideal choice for homes with children or pets. Thanks to a cordless Spring System, these room darkening blinds are easy to operate with a simple pull of the bottom bar. They can be set at any desired position and has a steady, adjustable roll-up speed. DESIGNED TO: Provide shade, darken room, create privacy, add beauty, block out UV rays, elevate decor. MOUNT: Inside or outside mount, all mounting brackets and installation manual are included.For inside mount, please be sure that the width of your window is 1/4 inch longer than the width of the shade. Use a Soothing Color Palette - Two popular choices to give your master bedroom a soothing, warm feel are: 1) Whites, grays and pale blues. 2) Whites, creams and taupes. Add Furniture - Not all bedrooms have the space, but if you do, adding a chair or a small table can give you a place to curl up with a good book before crawling into bed. Area Rug - Whether your bedroom floor is carpeted or you have a hard surface, an area rug is a nice addition. Place it under the bed or at the foot of the bed, or any number of other places, it'll add a sense of style and comfort. Pay Attention to Furniture Size ​​- Small furniture in a big bedroom will look lost, and big furniture in a small bedroom looks overwhelming. The size of your furniture should match the available space in the room. When it comes to remodeling your master bedroom, there's really no one way that works better than the other. The truth is, it takes good planning, reasonable budgeting, an open mind and a sense of adventure to develop the space into a room you completely enjoy . . . by in the end, it's always worth the headache.